Businesswoman Yelena Baturina, a wife of former Mayor of Moscow Yuri Luzhkov, talks about business, politics and her new BE OPEN foundation. Yelena Baturina is an intriguing figure. Forbes magazine has listed her as Russia’s richest woman for the last five years, but she grew up in a two-roomed Moscow flat. Her life has been dramatic and controversial. Today, she is a billionaire businesswoman and last year she created her own design think tank, with a global outlook and ambitious aims. Born in the Soviet 1960s, Baturina describes herself as coming from a “simple, working class family”. She worked in a tool-making factory while studying in the evenings for a degree from the State University of Management in Moscow. Baturina’s UK offices occupy a beautiful 18th-century townhouse in Mayfair. A dynamic artwork next to the reception desk turns poetic lines by Pushkin into currency rates via a tangle of electronic display strips. BE OPEN’s interpretation of “design” incorporates almost anything; during the next two years, the project will visit “the four corners of the world.” There are plans for an event in Delhi in February 2014 and another in Tokyo the following year. Baturina made her fortune in construction, but one favourite Moscow building project was never realised: Hamburg-based architect, Hadi Teherani, designed a series of futuristic domes that would have become the business complex “Cosmo Park”. Is it different doing business in Europe? “No,” she laughs; “It’s exactly the same. There are interesting investment and production opportunities, there is ambition and competition, there are laws and certain business rules, and everywhere there are those who try to break them, fraudsters.” But she doesn’t feel it is a good time to invest in Russia. “I don’t see any guarantees of profitability for my investment,” she says. 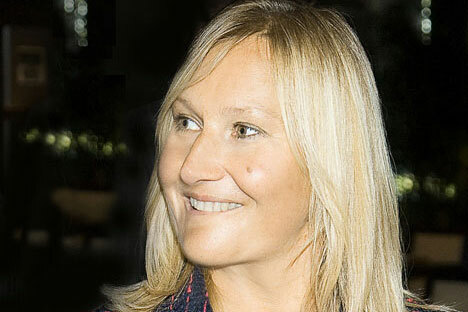 Yelena Baturina founded Inteko LLP in 1991. Initially the company manufactured plastic tableware. In 1991 Baturina married Yuri Luzhkov, who in 1992 became the mayor of Moscow. In 2001 Inteko entered the construction business, buying a controlling stake in DSK-3, one of the leading residential building companies in Moscow. The company managed to gain control of about a quarter of the prefabricated construction on the Moscow market. In 2002 the company added a monolithic construction division. In addition, Inteko began buying cement factories, becoming the largest supplier of cement in the country. In 2003, a resolution of Moscow city government made the company one of the main investors in six integrated development projects all at once. In 2004 the company received the rights to renovate several buildings in the historic center of Moscow. In that same year Inteko received authorization from the Moscow city government to develop plots of land and design hotels and tourist resorts in Moscow. In 2005, the company focused on building monolithic housing projects and commercial real estate. From 2004 to 2007, Inteko constructed an academic building for Moscow State University. From 2005 to 2008 Baturina's personal fortune increased from $1.4 billion to $4.2 billion. By 2009, due to the economic crisis, it had fallen to $900 million. According to experts, Inteko was worth $3 billion before the crisis. In 2010, it was estimated to be worth $1.5 billion. In September 2011, a year after Luzhkov resigned as mayor of Moscow, Baturina sold Inteko. According to insiders, the value of the assets sold was about $1.2 billion. Baturina is now actively investing in the hotel industry. This began even before the events of 2010. In 2009 the Grand Tirolia five-star hotel was built in the Austrian town of Kitzbühel at a cost of 35 million to 40 million euros ($47.6 million to $54.4 million). In 2010 the New Peterhof hotel opened in St. Petersburg. In 2012 the small Quisisana Palace hotel in Karlovy Vary, Czech Republic, opened after being renovated. In 2013 the Morrison Hotel in Dublin, which had been purchased for $30 million, reopened after being remodeled. All of Baturina's hotels are managed by Martinez Hotels and Resorts, which is based in Austria. By 2015, Baturina plans to expand her business to 14 hotels.